Happy Holidays!! The Stampin’ Up! Holiday catalog is LIVE today! What does that mean for you?? You can order your Holiday goodies to make your Holiday cards, Bags, tags and boxes for all the fun Fall Holidays! 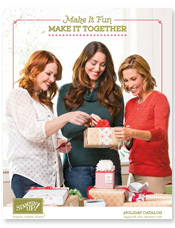 Check out the Holiday Catalog HERE. Have you been waiting to place your order?? Then you can click HERE to go to my online store. Use the Hostess code YN3QPRPV on the bottom left of the order page when you place your order. Stampin' Up! Holiday Catalog. Bookmark.